Despite using the Lawn Mower for years, many users are not aware of the right way to use it. Lack of knowledge and instructions are leading the people to use it the way they find it comfortable and smoother cut. There is no doubt that there is no instruction manual for it because of the instructions users are not able to take full leverage of the Lawn Mower. Today we will show you the right ways to use your Lawn Mower to its 100% capacity. What's The Best Direction To Mow Your Lawn? Every product comes with a set of manual, and it may not be able to tell you the whole story, but it will assure that you will gain knowledge about your Lawn Mower capabilities and features. You may use the rest of the tips which are going to list below can be followed after you read the instructions for it. It is wise that you select the highest setting for your grass. Cutting the top of the lawn in one shot will be ideal. Wondering why? The grass which has been cut down properly tends to make deep roots and find its way to water, nutrients in the soil. Which is why cutting down 1/3 of the grass will not force the grass to create deep root system. If your lawn is wet then cutting through would be slightly uneven and wet grass and clippings will clog the blades. If you want to cut clean and do not want to mess then you can wait till the garden is dry. It is advised that you mow in a different direction. By doing that, you will not compact the soil from its position and the grass will stay still and grow in the direction you mow. Always change the position and orientation you mowed last time. Every grass has its way to live and grow, and you need to identify it. In winter you have to mow at least twice a week and in summers once in a week. You have to understand the way of grass life and its growth. 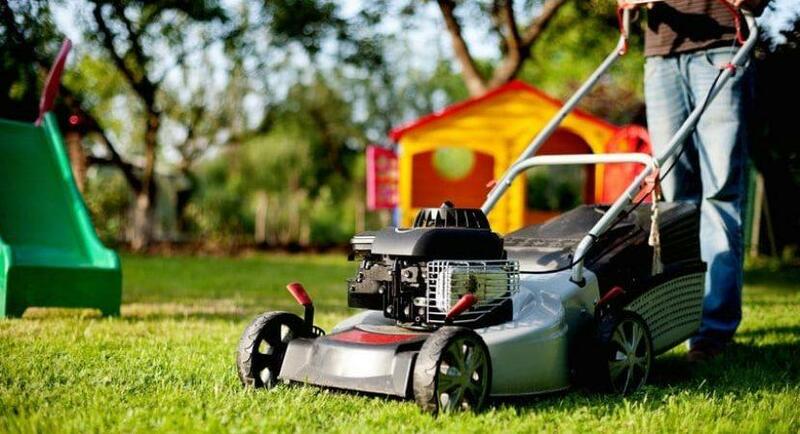 Did you know that cutting the lawn can also lead to the higher risk of growth? Well, it is said that grass feels stress and shock which will ultimately help it grow more. It is advised to cut 1/3 of the lawn to keep it calm and grow normally. Have you ever noticed that the color of your grass is Grayish-brown? Did you know what caused it? Your blades are growing dull, which are ripping up the grass. Change the blade and always let your garden dry up. It wasn't that difficult, isn't it? The instructions are for those who want to learn the right way to keep the yard clean and beautiful. It isn't that difficult to follow the instructions. A few precautions can lead you to have the best lawn in the region. If you have any questions then make sure to comment below.